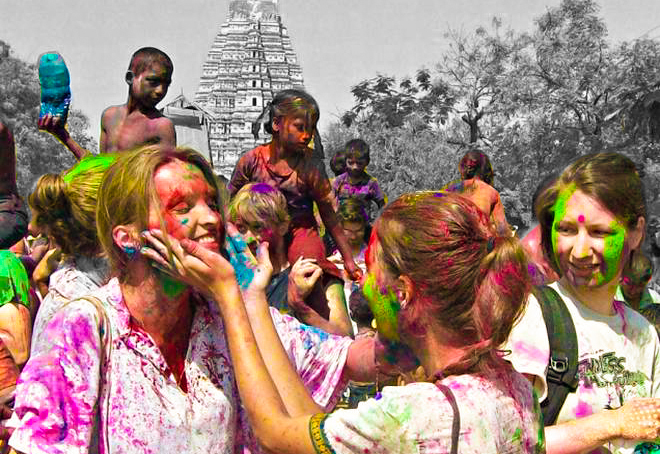 Holi is a Hindu spring festival celebrated all over India. It signifies the victory of good over evil, the arrival of spring, end of winter, and for many a festive day to meet others, play and laugh, forget and forgive, and repair broken relationships. In Hampi we celebrate Holi with much enthusiasm. Travellers both foreign and domestic celebrate along with the locals. Sweets, colour powder, pichkaris all are part of the celebration. We were curious to find out if Holi was celebrated during the Vijayanagara period and here is what we found. Nicoli Conti, an italian merchant who visited Vijayanagara in 1420 -1421 CE talks of 4 important festivals that were celebrated by the entire population of the city back then. The first when men and women, having bathed "clad themselves in new garments, and spend three entire days in singing, dancing and feasting," the second when inside and outside the temples "innumerable number of lamps of oil" were fixed, the third "which lasts nine days" and the fourth "during which they sprinkle all passerby, even the King and queen themselves with saffron water ... This is received by all with much laughter". The sculptures on the outer enclosure wall of the Ramachandra Temple in the Royal Center illustrate a scene similar to what Nicoli Conti describes. On the fifth row (top) of illustrative sculptures there is one notable scene that depicts a man and some women throwing (coloured) water on each other; tubes for squirting are clearly discernible in hands of some the women. Such scenes are found elsewhere, too. On the Mahanavami platform there are reliefs showing figures playing with water. Relief sculptures are also present in the Vishnu temple in Royal Center that depict similar scenes in great detail. Here there are eight panels of reliefs of women, occasionally with a man in the center, engaged in playing with water; a water squirt is shown in the hands of one of the women, while others are taking water out of big containers with small cups or seated in a tub is shown. The presence of a male musician, a female dancer and of a hunchbacked clown holding a water-squirt highlight the lighthearted fun and merriment that marked this festival. The sculptures mentioned here range from 14th century to 16th century periods, which means this spring festival was celebrated in similar way throughout the reign of Vijayanagara empire. It is clear that the spring festival was celebrated with much gusto in the Vijayanagara era much in the same way as we celebrate Holi today. Author Anila Verghese suggests that the fourth festival described by Nicoli Conti and represented in above described sculptures is Vasantotsava, that fell on the full moon of Chaitra (March - April) rather than Holi, which is celebrated on the full moon of Phalguna (February - March). The literary and archaeological data available points to the celebration of Vasantotsava. Vasantotsava is associated with the worship of Kama (or Madana or Manmatha), the god of love. Kama is also the demi-god of the spring season, thus also called as Vasantha. In course of time the worship of Kama or Madana died out and the great festivity connected with it was transferred to the spring festival of Holi. So this year when you celebrate Holi remember that the celebration associated with it has a long history of merriment and fun.